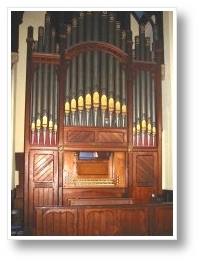 Sweetland built the organ specifically for its position at the front right hand side of the church. It is higher than the norm with the Swell section speaking out above the Great. Blowing action electrified in the 1930's by Osmonds of Taunton. The tracker action is fairly light and responsive - even at full organ. This is probably at least in part due to the daily use and routine maintenance performed by the organists. A full restoration along with enhancement of the weak Pedal division was completed in 2006 by Michael Farley of Budleigh Salterton, Devon. New additions are marked with a cross above. Further work was carried out by Michael Farley in 2010 with the installation of a new Trumpet stop (playable from both the Swell and Great), a 16' Bourdon on the Great (from the Pedal Bourdon) and a Quinted 32' on the Pedals. These additions are marked with an asterix above.